We’ve been writing about the war on cash for a long time. Governments have been forcing citizens to give up cash and rely exclusively on digital payments in the form of credit cards, debit cards, direct deposits, PayPal, online payments, Apple Pay, Venmo, and a hundred other apps. What they have in common is that digital payments can be monitored, frozen, taxed and debited with negative interest rates with a few keystrokes or an algorithm. When pigs are being slaughtered, they are first rounded up into pens where they are easy prey. The same is true with savers. Your savings are being rounded up into digital slaughterhouses at J. P. Morgan, Citi, Bank of America, Wells Fargo and a few other banks where they can be frozen or confiscated whenever the government wants. Your “money in the bank” is not your money; it’s the bank’s money, and they’ll give it to you if they feel like it and if the government allows it. This article reports that a backlash is developing. 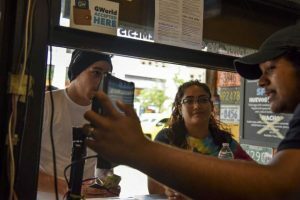 More restaurants, coffee shops and other retail establishments are refusing cash and requiring the customers use digital payments. But, up to 10% of the citizens of most major cities don’t have bank accounts or credit cards. These “unbanked” citizens are discriminated against and shut out of the brave new world of digital payments. The unbanked deserve sympathy, but they are part of a losing battle. The benefits of a cashless society are embraced by retail merchants as much as they are pursued by the power elites. The complete elimination of cash is just a matter of time. Once the cash is gone, if you want real money, you’ll have to hold gold or silver. The best strategy is to buy it now before you can’t get it at all.